With five packages to choose from, Historia can provide services to match any budget or need. Every package can be fully customized. Note that these packages are designed for a typical wedding format (one-day event featuring a ceremony and afternoon or evening reception). 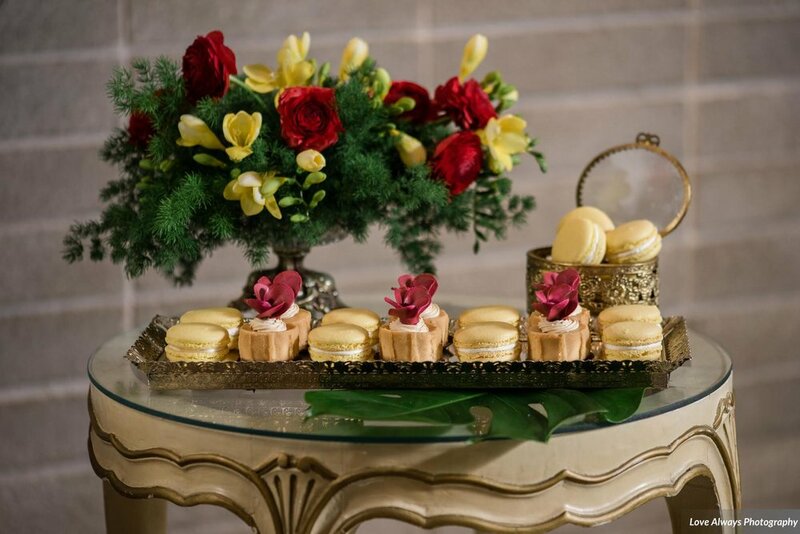 Multi-day events and smaller, dinner-party style weddings are subject to custom pricing. Have a request that falls into one of those categories, or even a custom service request? Get in touch and we’ll send you a quote. Proposal Planning, Corporate Event Planning and other Special Event Planning rates are also priced on request. Bliss, Serenity, Radiance and Divine packages all include a complimentary, no-obligation initial meeting before signing. Our most affordable service, our Tranquility package is essentially a simplified form of day-of wedding coordination. It works well for those with smaller weddings (under 75 guests) or for couples who would like a hand with setup or specific details on their wedding day – maybe arranging your décor or DIY items, being cued for your ceremony, or having a dependable go-to person on your special day, so you can relax and have fun! One introductory, Details meeting, to go over the essentials of your wedding day (approximately 1-2 hours). 6-8 hours of wedding day coverage and management, with one assistant until dinner service*. This also includes setup of small cosmetic details (such as receiving table décor, place cards and favours, and other miscellaneous items). As long as time permits, Historia can set up or transfer other items from your ceremony to your reception, upon request. Our Bliss package starts 4-6 weeks before your wedding day - or later, if your wedding is fast approaching and you’re on a time crunch! This is largely a month-of service, going much further than our Tranquility package. All inclusions of our Tranquility package, with an upgrade to 10 hours of wedding day coverage. One final, Itinerary meeting, to discuss your wedding day schedule in detail (approximately 1-2 hours). Access to support from Historia via phone or email. Handling of vendor logistics, as they relate to your ceremony and reception locations (and photo locations if applicable). This includes distributing a vendor copy of your Itinerary and confirming final details and logistics with vendors. Wedding rehearsal direction/attendance, if desired. Our versatile package for couples who have done some of their own groundwork, our Serenity package is best suited to couples who have already booked their venue(s) and one to three vendors, but need help to keep going. Sometimes other companies call this a partial planning service. Regular meetings and check-ins with Historia, plus access to support via phone or email. Further consultations/meetings at your request (within reason). Regular check-ins from Historia, plus access to support via phone or email. A detailed, Month-to-Month Checklist as your own personal wedding planning schedule. Correspondence with your vendors on your behalf, to ease the execution of your vision; this includes handling of vendor logistics throughout the planning process, distributing a vendor copy of your Itinerary and confirming final details and logistics with all your vendors. Assistance with executing your décor vision through your selected vendors and added touches. Venue/location site inspection(s); assistance with floor plan design, if required. Access to Historia’s expertly-designed templates and guides for management of your guest list, vendor payments, invitations and more. 10 hours of wedding day coverage and management, with one assistant until dinner service*. This also includes setup of small cosmetic details (such as receiving table décor, place cards and favours, and other miscellaneous items). As long as time permits, Historia can set up or transfer other items from your ceremony to your reception as well, upon request. Our most popular full-planning service, our Radiance package is designed to keep you organized from day one of your planning process. Recommendations and assistance in selection of venue and photo locations, with visits to up to four different venues/spaces. Once your reception venue is confirmed, Historia will attend all venue appointments with you where necessary, and will correspond with your venue on your behalf to execute your vision. Up to 10 hours of wedding day coverage and management, with one assistant until dinner service*. This also includes setup of small cosmetic details (such as receiving table décor, place cards and favours, and other miscellaneous items). As long as time permits, Historia can set up or transfer other items from your ceremony to your reception as well, upon request. Our most elaborate and in-depth, full-planning service, our Divine package is designed to cover every facet of your planning in immense detail. With Historia attending all your vendor appointments with you, no stone will go unturned, and you can utilize our expertise in every way possible. Rest easy knowing you’re very well looked after! Recommendations and assistance in selection of venue and photo locations, with visits to up to six different venues/spaces. Once your reception venue is confirmed, Historia will attend all venue appointments with you where necessary, and will correspond with your venue on your behalf to execute your vision. Vendor recommendations and assistance in selection to match your style and budget, including visits with up to three different vendors per individual category with Historia during selection. Visits to secured vendors is not limited. Individual Categories include: 1) Photography/Videography, 2) Florals/Decor, 3) Rentals, 4) Stationery/Signage, 5) Music/MC/Performance Art, 6) Food/Beverage, 7) Gifts/Wedding Favours, 8) Transportation, 9) Attire. Full wedding day coverage and management (until event end), with one assistant until dinner service*. This also includes setup of small cosmetic details (such as receiving table décor, place cards and favours, and other miscellaneous items). As long as time permits, Historia can set up or transfer other items from your ceremony to your reception as well, upon request. *Additional hours and assistants are available at an extra charge and may be required for longer or large weddings with over 200 guests.